"Whether you're eating gluten-free or not, this is just a really nice, and very easy, winter dish." Place butternut squash in a large bowl, and season with curry powder, cumin, sea salt, and black pepper. Toss with a fork, then stir in the egg, garbanzo-fava bean flour, and corn flour. Mix in cooled onions. 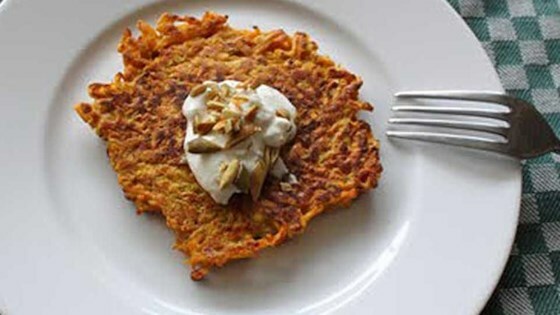 See how to make light and crispy squash cakes. My husband and I loved this recipe. Next time we'll add a little more pepper and curry. I didn't have corn flour so used coconut flour instead. Very good! Great! we had the sour cream for the garnish, but everyone ate them down and went back for more without ever touching it. Definitely being added as a family favorite.